Drones do seem to be the new kind of Tamagotchi among the young children, although you can be sure that Tamagotchis are a whole lot more affordable than an actual drone, due to the obvious fact that drones require a whole lot more electronic parts within the chassis, and are very complex devices to boot. Still, there is a growing market for drones, and it does not look as though this is going to slow down anytime soon. One thing is for sure though, the SKEYE Pico Drone is a whole lot smaller than the Parrot Night Jumping Drone, and TRNDlabs has done a pretty good job with it so far. 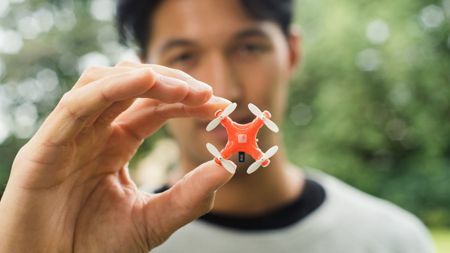 In fact, TRNDlabs has claimed that the SKEYE Pico Drone is the smallest drone in the world that is commercially available, and we would not want to argue with them since it measures an incredibly compact 2.2 cm x 2.2 cm (0.87 inch x 0.87 inch), and if you were to place it on a scale, you can expect to see the needle stop at a mere 7 grams (0.25 ounce). Just how small is that? It boggles the imagination, really, but you can be sure that it is tiny enough to sit on your finger – read your finger, and not your palm – and yet still possess of the capabilities to be able to handle precision controlled exercises, even making its way into the narrowest of nooks! In other words, this is a drone that is meant to be taken everywhere as it can be conveniently fitted inside of its own controller. Sporting Ready to Fly Technology (RTF) and 3 levels of sensitivity, the SKEYE Pico Drone is incredibly easy to control and maneuver. It does more than just hover up and down, as the 6-Axis flight control system and auto-adjustable gyro sensitivity would let you have it perform flips, spins, and epic aerial dives – once you get some practice in, of course. Built in LED lights will also let you fly it the whole night long, battery permitting, of course.